A secure and scalable infrastructure for companies working on a reduced budget. Each day there are many small companies and startups launching their e-commerce operations. Backed by venture capital or private savings, these businesses seek to build innovative and user-friendly platforms. What they also require is a secure and scalable infrastructure, and at minimal cost. 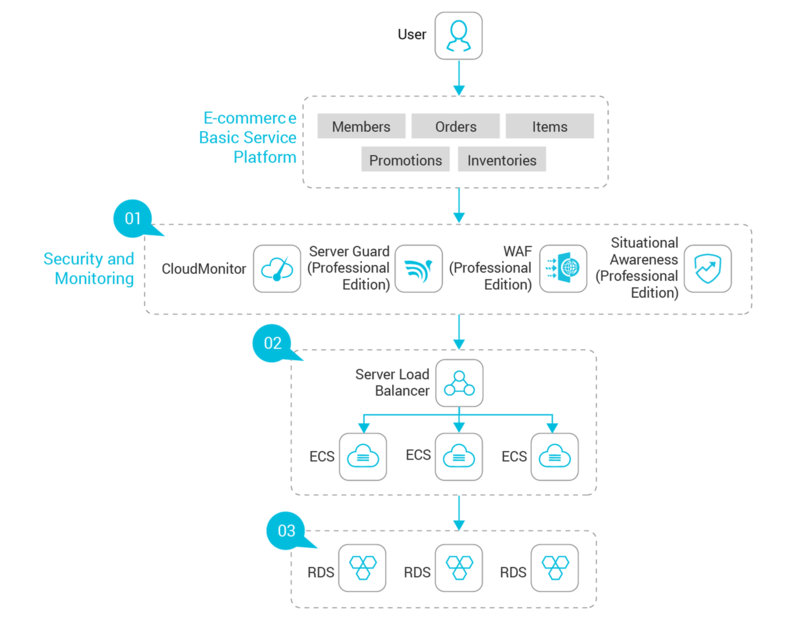 Alibaba Cloud Web Application Firewall (WAF) in combination with Server Guard and Situational Awareness ensure protection against common cyber-attacks including DDoS attacks. This includes providing intrusion prevention and security management for servers and detecting potential intrusion and attack threats by using machine learning and data modeling. This also includes innovative server security solutions for added protection. CloudMonitor then monitors resources and Internet applications, detects service availability and sets alarms for metrics. CloudMonitor gives customers a comprehensive understanding of usage, performance and the operating status of their Alibaba Cloud resources. Server Load Balancer eliminates any single-point-of-failure (SPOF) and ensures system stability during situations of high concurrency. The service scales ECS instances dynamically to respond to changing traffic needs. Alibaba Cloud’s RDS stores structured data. The active/standby RDS architecture prevents SPOF's in various task areas, including orders, inventories, promotions, and other core data items. When demand for computing resources fluctuates, Auto Scaling automatically scales up or down to meet the change in demand. A recommended cloud architecture for smaller e-commerce companies.